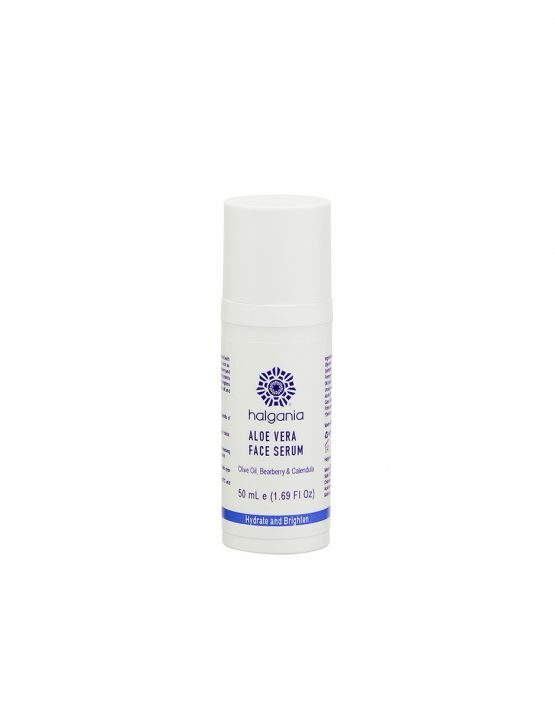 This Aloe Vera Face serum is formulated with natural anti-ageing ingredients to nourish and brighten your skin keeping it nourished the whole day. Aloe Vera, Calendula, Elderberry and Bearberry extracts have healing, moisturising and anti-inflammatory properties keeping your skin looking young and healthy. Product ID: 2304 Category: Face Care. Apply to face after cleansing and before daily face cream. Avoid applying around eye area. Please do not use if you are sensitive or allergic to the ingredients. For Adult use only. Avoid contact with eyes. Aloe Vera Leaf Juice*, Glycerin*, Cetearyl Glucoside (and) Sorbitan Olivate, Leuconostoc/ Radish Root Ferment Filtrate, Crambe Abyssinica Seed Oil (and) Phytosterols (and) Olive Oil Unsaponifiables, Bearberry Extract, Alcohol*, Calendula Extract*, Sclerotium Gum, Elderberry Extract, Xanthan Gum, Potassium Sorbate, Parfum. Olive Oil – High in essential fatty acids with excellent penetration which soothes and reduces the appearance of scars. Bearberry Extract – A natural antioxidant which can brighten skin tone. Calendula Extract – It soothes the irritation of dry skin, protective and relieves itching due to dryness.